In 1883, Francisco Serra Soto (1840-1918) and his brother José Serra Soto (1847-1903), sons of Catalonian Francisco Serra Anglada, acquired a 400 cuerdas tract of land from Basilio Ortiz Diaz of which 150 were planted with coffee trees. In 1891 José Serra Soto acquired from Simón Battistini Pierluisi an adjacent 184 cuerdas separated from the original 400 cuerdas by the Barreal River of which 50% interest was transferred to his brother Francisco in 1893. The consolidation of these two tracts of land in 1894 are the origin of the 584 cuerdas Hacienda Burenes. Throughout the years, because of death and/or transactions between the Serra family, ownership of the hacienda changed hands between descendants of the Serra Soto brothers, the Serra Ramirez de Arellano descendants of Francisco and the Serra Gaztambide descendants of José. In 1914 the then sole owners of the hacienda, Domingo Serra Ramirez de Arellano and Maria Amelia Serra Gaztambide formed the Domingo and Amelia Serra Agricultural Partnership which after being dissolved in 1924 was reorganized that same year being its members Domingo Serra Ramirez de Arellano and his siblings; Altagracia and her husband Pedro Fullana Reinés, Carmen and her husband Damián Pizá Mayol and Rafael and his wife Valentina Colón and their cousin Amelia Maria Serra Gaztambide and her husband Rodolfo del Valle del Valle. The partnership was dissolved for a second time in 1926, subsequently, existing land is sold and additional land is purchased including 41 cuerdas acquired by Domingo Serra Ramirez de Arellano in 1931. In 1945 the Hacienda Burenes Corp. is organized as the sole owner of the hacienda. In 1955, the remaing land of the 41 cuerdas tract acquired by Domingo in 1931 and the two tracts of land originally of 400 and 184 cuerdas each, were sold by Hacienda Burenes Corp. to Carlos Bonaparte who was related to Rosario Bonaparte the wife of Domingo Serra Ramirez de Arellano. In 1957, Bonaparte sold the land to Francisco, Pedro and Jaime Fullana Serra, the sons of Altagracia Serra Ramirez de Arellano and her husband Pedro Fullana Reinés, who sold the property the very next day to Pablo Landrau Diaz. Since 1958 and until 1974 when it ceased to operate, Hacienda Burenes operated under the leadership of Pablo Landrau Rivera, the son of Pablo Landrau Diaz. 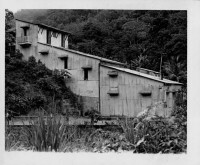 According to Archeologist Luis Pumarada O'Neill, the production facility of Hacienda Burenes had a peculiar three level architecture that took advantage of the mountain slope it is on. The original structure consisted of 4 levels, the top level where coffee was received and depulped, the third level where it was washed, the second level where it was initially dried and the lower level where it was dried and packed ready for sale. Using this method, coffee was moved through its different processes by gravity without with minimal touch by human hands. A hydraulic turbine on the lower level used water channeled from the nearby Portugués River to power the machinery located throughout all 4 levels. 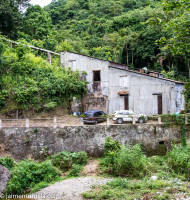 Located in Barrio Tibes, due to the rugged terrain where it is located, Hacienda Burenes did not have a "glácil", its coffee was dried in two mechanically run dryers that can be seen in the pictures below. The first gallery is a 1987 picture made available by permission and the courtesy of Archeologist Luis Pumarada O'Neill. The visible damage to the upper portion of the building was caused by Hurricane Georges in 1988.